May is Go By Bike Month | Home of the Crofton Bike Doctor Blog! Did you know that May is Go By Bike Month and Bike Safety Month? When many of us think about riding a bike in this country we think about it in a recreational sense. Yet the bicycle can really address a lot of the issues of our country such as dependence on oil, traffic congestion and the increasing obesity epidemic in both young and old. Have you thought about replacing a few of your trips by car by using you bicycle? This is one of my favorite statistics; 40% of all trips are within two miles of the home. Initially maybe a little hard to believe, but then stop and think about it, it is realistic. I bet you can ride your bicycle for two miles. Which of these trips could you use your bike instead of your car? Taking your children to and from school, sports practices, trip to the store for those few eggs that you need? How about the trip to the local hardware store for that one item you need to complete your project? Could you ride to work once or twice a month? In 1964, 50% of kids rode to school and the obesity rate was 12%…in 2004, 3%rode to school and the obesity rate was 45%. That is a huge change and the trend isn’t changing. Between 1960 and today the average weight of a 6-11 year old has increased 11 pounds. Another statistic; the average adult gains two pounds a year. Small changes in your family’s lifestyle and habits can lead to large improvements in your family’s health. I primarily commute by bike for runs to the hardware store or the grocery store. I find my bike is just as fast for these trips as my car. It doesn’t take much to start using you bicycle for short trips. Depending on what sort of trips you use your bike for you may find a rack, bag or basket to carry your items in helpful. These two items will make things simpler and easier for you. Simpler and easier means you are more likely to use your bike more. Cargo specific bikes are available that will carry two hundred and twenty five pounds but I recommend starting small. Don’t forget a lock to lock the bike up at your destination. The rest of the items you likely already have for your bike. A helmet for when you ride, a mirror so you can see what is going on, a bell to let others know you are approaching. If commuting by bicycle becomes a more regular activity for you then some additional items will increase your fun factor. Fenders will allow you to ride in a wider variety of conditions and keep you cleaner from any sections of water you may come across in your travels. Additions to your cycling apparel in comfortable tops or bottoms may be considered. Commuter apparel that looks like casual wear is becoming more popular and offered in more styles. For short trips though none of these items are really necessary, just wear what you need for your destination. 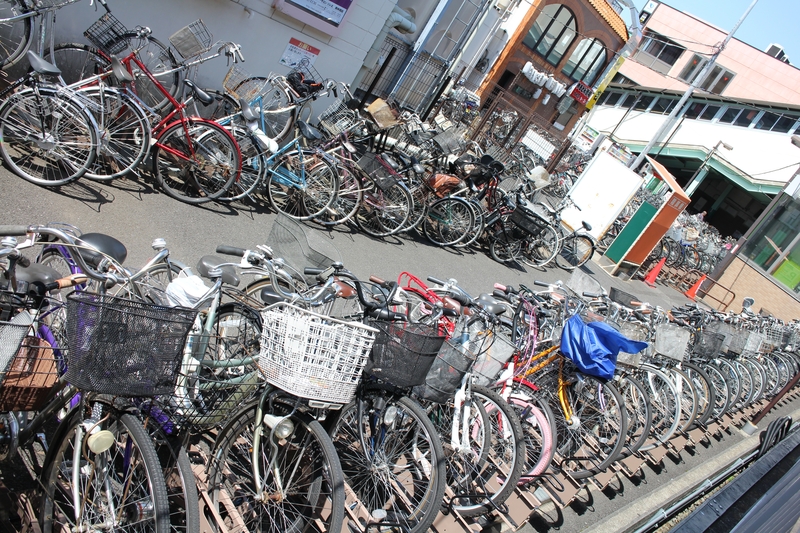 The important part is to start switching the short trips from your car to your bicycle. Riding your bike is fun and once you start to use your bike for commuting you’ll realize it is really easy and really fun. Each U.S. rush-hour auto commuter spends an average of 50 hours a year stuck in traffic. Being outside on your bike is a lot more fun than being stuck inside your car. Could your family take one or two trips a week by bicycle?